Layered shades feature a distinctive design with bold horizontal lines and clear, crisp colors that can brighten up a living room or an office. While its savanna-dwelling namesake uses its patterned coat to mix into its surroundings and hide from predators, this window treatment option can really make a room stand out. The design of these window coverings creates various patterns of lights and shades, depending on how far apart the blinds are adjusted. The design of these window treatments allows light to flow into the room while also allowing you to maintain your privacy. Layered shades can also be adjusted so that sunlight will be completely blocked, which is a perfect setting to use during the more dangerous times of day when UV exposure is maximal. The harmful nature of these sunrays means that you'll definitely want to reduce your exposure as much as possible, especially while you're inside your home. Built with select materials, our Premium Layered Shades include UV protection capabilities. Their sleek design, coupled with the crisp color choices, provide a refreshing appearance that - apart from providing excellent UV protection - can also really contribute to the design appeal of any room they're installed in. The compact headrail and bottom rail make for a clean and fashionable solution to mounting window coverings, and make layered shades easier to install and maintain. 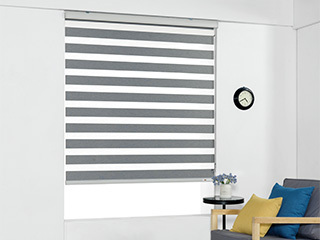 If you're thinking of getting new blinds but are unsure if this will be the right type for your needs, we'd be happy to help. Our layered shades, like all of our products, can be custom made to allow for a precise tailor fit installation that comes with a 5-year warranty. When it comes to quality, our team at Los Angeles Blinds & Shades never settles! Contact us today to get a free consultation as well as free color samples that will help you make the right choice for your home or office!